Kaufmann made summer study trips to the shtetls, small Eastern European communities that maintained their Jewish traditions and culture; working at home, he then turned his sketches into romanticized, nostalgic images of a Jewish way of life lost in modern, urbane Vienna. This portrait-like image (labeled “Hannah” in Hebrew) shows the sitter, possibly the painter’s daughter, wearing the traditional garb of a well-to-do married woman. Particularly characteristic is her splendid satin cap decorated with lace and pearls, signs of wealth and status. NOTE: Although the consignor of the painting in 1982 has remained anonymous, the painting had been in the family for at least two generations, belonging to the consignor’s grandfather, who passed away in 1950. According to information supplied by Christie’s, the consignor’s grandfather was an Austrian-Jewish banker and promoter of the arts, who lived in Vienna. He inherited the nucleus of his art collection from his parents. After the Anschluss, or annexation of Austria by Nazi Germany in 1938, he was persecuted by the National Socialists and in 1943 was deported to the Theresienstadt concentration camp. He survived and returned to Vienna in the summer of 1945. Though works of art from his collection were seized and sold by force as the result of Nazi persecution, this panel was in his possession at the time of his death. Thus while the exact whereabouts of the painting between 1938 and 1945 are unknown, if it was looted or sold by force during the Nazi era, it was subsequently returned. It remained with his descendants until its sale in 1982. ADDITIONAL INFORMATION: In the course of its initial research on this painting, the MFA learned that an Isidor Kaufmann painting described as a “Jewish Bride with Hebrew Characters” was plundered in 1938 from the collection of Arthur and Irma Czeczowiczka of Vienna and Bartsovice (the former Czechoslovakia) and, because this might describe the present painting, notified the Czeczowiczka heirs. 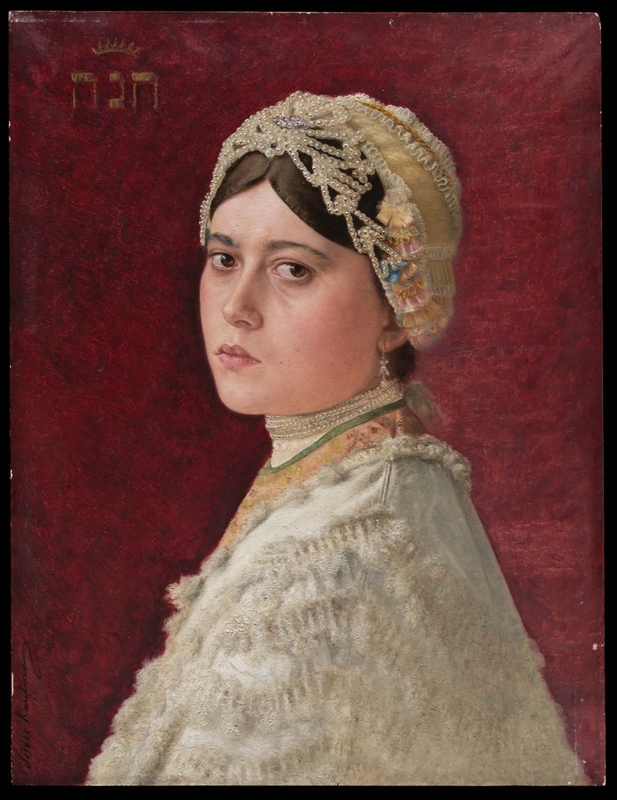 However, Kaufmann painted numerous images of Jewish brides and newlyweds. There is no evidence that Hannah is the Czeczowiczka painting; and indeed, the information subsequently supplied by Christie’s makes it extremely unlikely that the MFA painting is the one that the Czeczowiczka family lost.